Accudyne Systems, Inc. has used both standard and custom conveyorsoperating in closed- and open-loop control for a variety of purposes. To transport tempered glass from a material offloading station to register at the robot station on a rotary table we developed a 6-foot-wide, 29-foot-long conveyor table. In a cell test-and-sort machine, a coupled pair of traditional conveyors ran down the center of the machine, stopping at set stations for tests to be run on cells and for suction grippers to pick and place the cells according to test results. 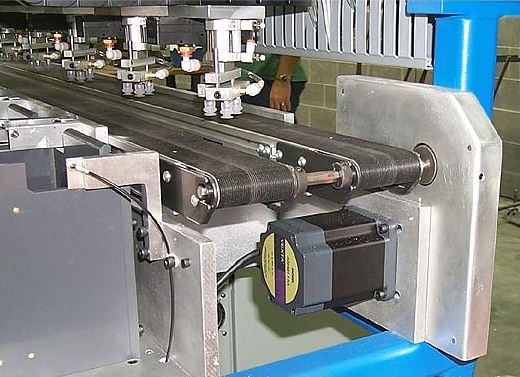 In another unique application, a vertical, adjustable conveyor system running on either side of a foam block allowed our End Capper to draw the block through the machine for processing. Whatever it takes to move you forward, Accudyne has the solution.